The theory behind sanders is pretty simple. The machine moves the sandpaper back and forth and round and round and the abrasives on the sandpaper abrade the wood making it smooth. Ahhh- were it that simple. 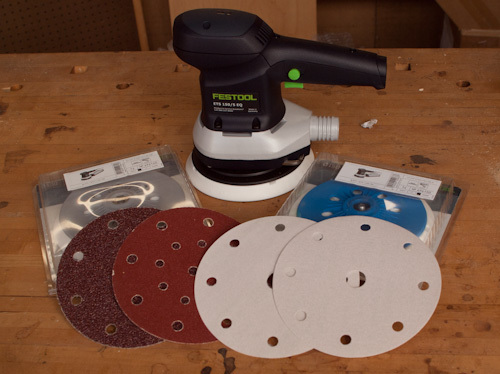 As your sandpaper abrades the wood the the saw dust that's generated puts a barrier between the abrasive and the work so that the sandpaper works less effectively. The buildup in sanding dust is easily remedied with a good vacuum system and that's the core of the Festool system. But there is a problem. The vacuums are far stronger than they need to be, so strong in fact that they cause suction between the sander and the work. This means that your sander has to work harder to move its pad and that generates heat. All that heat buildup heats up the pad and heats up the hooks on the pad that hold your sandpaper to the hook and loop pad. All that heat, softens the hooks and the hooks lose their grip on the sandpaper. Sanding pads are considered consumables but still it's annoying to wear them out. You have the same heat buildup problem if you constantly press too hard when you sand. There are two very simple solutions to this problem. 1 - Turn your vac down to about 1/2 power. The vacuums are designed to give great results for all the power tools, sanders really don't need a particularly powerful vac. So turn down your vac to the minimum suction that will give you total cleaning but not much more. You will find that the sander is easier to use, has less friction on the work, and best of all the pads will last longer. 2 - The same cure is used if you find yourself pushing down on the sander to try to make it sand faster. Pushing is more psychological than actually useful, and it will shorten pad life. As long as your dust collection works, you really should not need to apply much pressure to the sander. Get used to lightening up. If you want the sander to sand faster make sure the paper is still sharp and cutting and if not replace it. For really fast removal use coarser sandpaper, but make sure you don't jump too many grit sizes. Coarser paper makes coarser scratches in the work and when you graduate to the next finer grit you will have to remove the scratches you made. While I am on the subject I should mention something about sanding pads in general. All the Festool sanders come with a "soft" pad as standard. Most of the sanders have "hard" and "supersoft" pads available as accessories. Here is the deal: A harder pad is more accurate but less forgiving. For example: If you want to create a mirror surface you need a flat surface. A hard pad will sand any small high spots and give a flatter surface. But because the hard pad is less forgiving it will also sand through high spots on your finish. That's okay if you want that mirror finish - but a waste of time is you want a typical finished surface. A "super-soft" pad will easily follow small variations in the surface, and is very forgiving. But if you are looking for a mirror surface you won't get any accuracy any any uneveness in your finish will stay put. The "soft" pad is a compromise between the more extreme pads and is perfectly the right pad to use for most applications. Incidentally for making perfectly flat mirrored finishes, in the last century finishers would use flat, unforgiving, marble sanding pads for their most finicky work. While I mentioned this last week, I will mention it again just so on March first I don't get yelled at. Festool prices are going up on March 1. Tools about 3%, accessories about 6%, but it's not across the board. What exactly is the difference between the disk sanders and the square sanders? The square ones say they are random-orbit, and I've always had good luck with them at creating a smooth surface. It seems that almost everyone now uses the round ones, but I've never wanted to start paying for the higher priced discs - I can cut a single sheet of paper into 4 pieces. What am I missing about these round ones? The defining action of a random orbital sander is it's stroke. If you have two sanders with the same stroke they should work more or less the same. There can be some differences in dust collection - the hole pattern of round vs square pads might make a difference and better dust collection = longer sandpaper life.